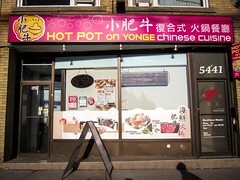 On my way to work, I noticed a change in one of the restaurants along Yonge. A neighbour of Nome and Kenzo, previously an Italian restaurant, bore a simple new sign with the name “The Fry”. After reading a blog review and finding out they specialized in KFC (Korean Fried Chicken), my next dinner out was decided. Atmosphere: The interior decor of The Fry hasn’t changed much from the previous occupants. The wooden tables and booths seem a dated but the lighting has been dimmed and the music turned up. Another difference was how full the restaurant was. We were lucky to get a table before the line started forming outside and the queue was steady throughout the night. Diners ranged from young families to boisterous friends all enjoying the fried chicken and pitchers of beer. Service: I only saw two servers taking care of the floor who were responsible for seating guests, taking orders, serving plates and clearing tables. Our order arrived quickly and hot, but it was a busy night and it was challenging to flag down one of the girls to refill side dishes or water. 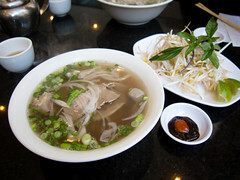 The service was professional but another body could have eased the rushed vibe and made time for a warmer interaction. 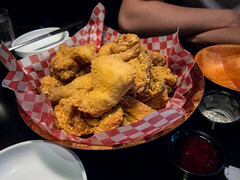 Food: Korean Fried Chicken differs the most from North American style in the cooking process. KFC is fried twice, resulting in a crunchier, less greasy skin. I found the chicken pieces were also smaller and more tender than at Western bars. Every time I’m hungry I make the same mistake of listening to my stomach over my brain. 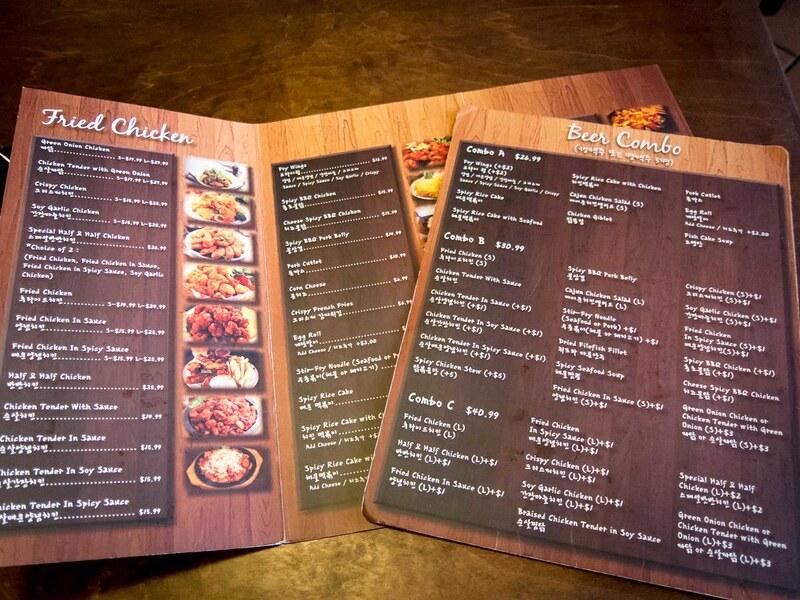 The menu lists all different ways KFC can be enjoyed with different sauces, portions and cuts. There are also beer and chicken combos at three different price ranges. Since both The Fiance and I were hungry, we thought we needed at least a Large portion of the chicken and ordered the Half and Half Beer Combo C. This combo allowed us to try two flavours and wash it all down with a pitcher of domestic beer. We chose the dry and classic sauce options. 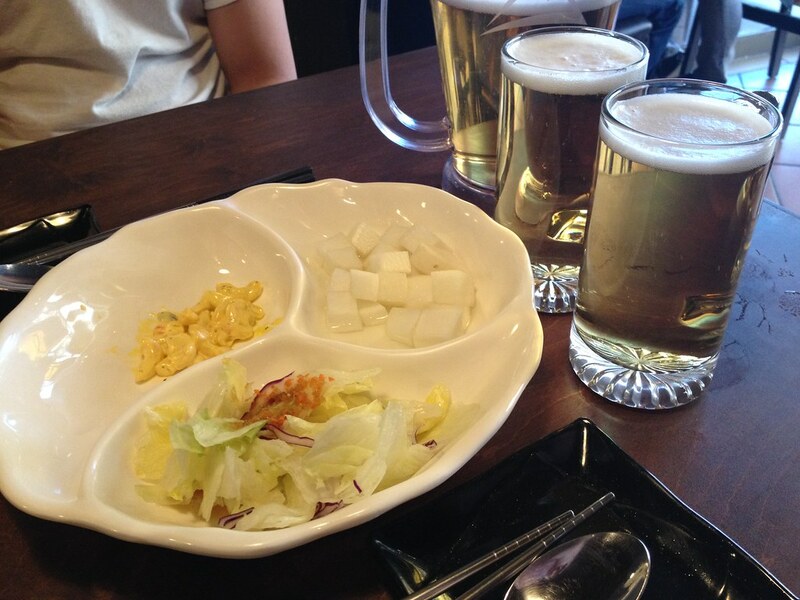 After we placed our order, a sectioned plate with side dishes was served along with our pitcher. The three side dishes provided was an iceberg salad, pickled radish and macaroni salad. I’ve always loved sweet pickled radish and the cubes at The Fry were perfect, crispy, sweet and sour. We ordered refills throughout our meal. The chicken lived up to all of my expectations and more. The skin was crispy, well seasoned and the meat tender and moist. 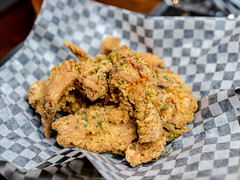 One of the best pieces of fried chicken I’ve had in Toronto. I enjoyed the tangy classic sauce while The Fiance preferred the dry option. Both were excellent and I can’t wait to go back to try the spicy sauce. 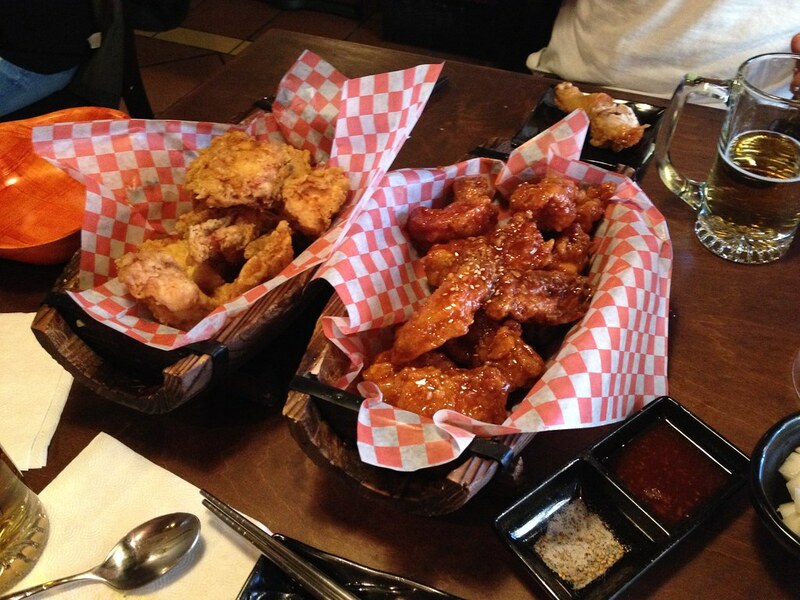 All cuts of the chicken were used, which resulted in some boneless pieces and a nice ratio or dark and white meat. I do have to caution that a large portion is too much chicken for two people. We were one piece away from finishing our meal, but it was a belt-loosening, wish I had worn stretchy pants kind of finish. Next visit, I’ll be prepared.